In a remarkable tour de force of research, Shelley Pearen reveals the innermost thoughts of the people who assembled 150 years ago to negotiate the future of Manitoulin Island, the world´s largest freshwater island. Working with long forgotten letters, reports and accounts written in English, French and Ojibwe. 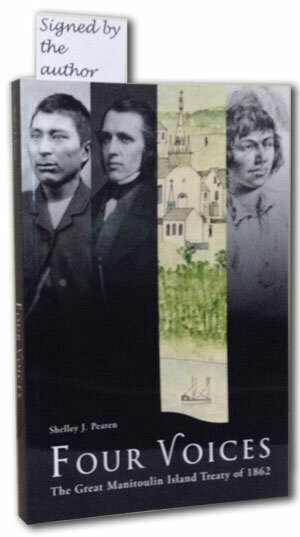 Pearen brings to life the people and events of 1861-63 through the actual words spoken and written by four key participants: William McDougall, head of the government´s Indian Affairs department; Sasso Itawashkash, chief of the Sheshegwaning Anishinaabeg; Jean-Pierre Choné, Jesuit priest at the Holy Cross Roman Catholic Mission in Wikwemikong; and Peter Jacobs, Church of England missionary in Manitowaning, and himself Anishinaabe. For the first time, each of these players is given the stage to explain his own understanding of what actually happened before, during and after the signing of the still-contentious Great Manitoulin Island treaty of 1862. These four voices reveal fascinating personal stories of strengths and frailties. 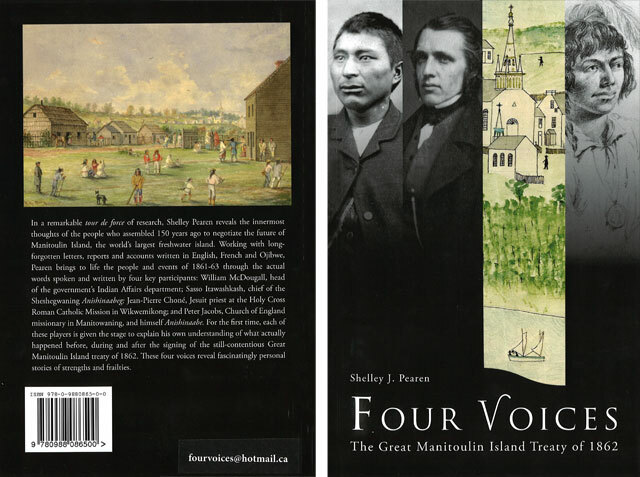 Four Voices: The Great Manitoulin Island Treaty of 1862, 6″ x 9″, 193 pages with ilustrations, notes and bibliography, published October 2012, ISBN 978-0-9880865-9-9, $25 paperback. Shelley J. Pearen is the autor of Exploring Manitoulin and co-transcriber/translator with William Lonc S.J. of Letters from Manitoulin, Letters from Wikwemikong, Memoirs of the Jesuit Mission at Wikwemikong, Letters from th Ft. William Jesuit Mission, Letters from the Sault Ste. Marie Jesuit Mission, and Letters from the Jesuit Mission at Sandwich. Ms. Pearen has been researching the history of Manitoulin Island for 40 years. The Anishinabe Spiritual Centre has copies of this book signed by the autor. Among the Indigenous Peoples of Northern Ontario – Fr. Mike Stogre, S.J.